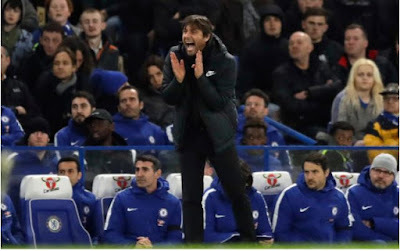 Antonio Conte is looking forward to pain. The Chelsea coach knows precisely what is required of his team to beat Barcelona on Wednesday and progress to the Champions League quarter-finals. And it will not be pretty. And this is what he says will be required if his team are to inflict the first home defeat on Barcelona this season. After watching his old club, Juventus, progress last week against Tottenham in very similar circumstances to those Chelsea’s face – winning away after drawing the home leg – he pointed out that his side lacks something the Old Lady has in abundance. Though when it comes to experience, at least one of his players knows where to seek advice. Marcos Alonso may be about to make his first appearance at the Camp Nou, but his father Marcos played for Barca for five seasons in the Eighties. As for his grandfather, another Marcos, he won the European Cup five times with Real Madrid. “My grandmother has five replica cups at home,” said Alonso of his family history.